Lowdown: Karl Urban shows Aussie politicians what being tough on crime really means. One might ask what is the point with another take on the Judge Dredd formula, given the nineties version's most notable contribution was the introduction of one Sandra Bullock. [18/11/2013: Yours truly apologises for his advanced senility. As has been pointed out to me in the comments below, I managed to dreadfully confuse Judge Dredd with Demolition Man. Sorry.] But, you know, comic based movies are all the rage now, so why not? Plus it has to be said: as far as reboots are concerned, the new Dredd is not bad. Not bad at all. Perhaps this is because it feels totally different to its predecessor. Karl Urban puts on the Dredd mask this time around (and, it has to be said, does not take it off throughout the movie; all you see of him is his chin). Dredd lives in a post apocalyptic future where radiation has confined the residents of the USA to a tight area that is now a single mega city. This new age Detroit is rife with crime and poor on resources, with the only force preventing total anarchy being the judges: police officers with the authority to exercise their own ruling on the spot. In other words, something like Obama’s FISA courts. Essentially, Dredd takes us through a day in the life of Judge Dredd. But not your typical day: this time around he’s to be encumbered by a new young policewomen trainee (Olivia Thirlby) who failed her professional tests but who is still pushed on to the role because of her psychic abilities. Yes, we have ourselves a new Sandra Bullock, and yes, those psychic skills will prove useful by the end of the day. Our heroes follow up some baddies through a conventional car chase. The baddies reach a 200+ storey skyscraper brimming with people, some sort of an ultimate slum. This slum turns out to be the layer of a particularly nasty drug queen (Lena Heady, who seems to have acquired monopoly over psycho yet powerful women roles at the moment). This queen won’t allow the secrets of her latest drug out: a drug that slows the perception of time by three orders of magnitude and thus provides ample opportunity for the film to feature plenty of slow-mo action. She closes the building off and wouldn’t let anybody in or out until the judges are dead. Obviously, she picked on the wrong judge to pick on. Blood baths ensue. Thus Dredd ends up a lot like an earlier Urban affair, Doom. It’s very violent, and graphically so (further enhanced by the prevailing deterioration around). And it’s all action, no mercy, and not much else. Style wise, the action is very reminiscent of video gaming: hero steps into a corridor, baddies await by side doors, hero uses various weapons to kill baddies and progress. Did I mention similarities with Doom? I do have to say, though, that Dredd does its thing quite well: I’m all for violent films showing us what violence really looks like, or showing us more than the usual glorification of violence that we get elsewhere. Dredd tries to be very “in your face”, fully succeeds, and deserves to be acknowledged for its achievements there. Between that and its short hour and a half long duration, Dredd is a very effective action rollercoaster. Way better than Stallone’s, no doubt about it. 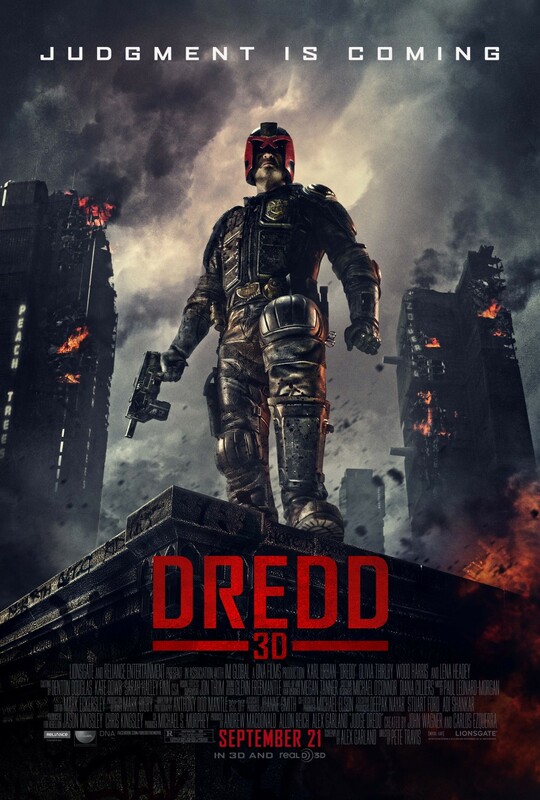 Overall: I quite liked Dredd; I think it just makes the 3.5 out of 5 stars mark. I think you’re combining Judge Dredd with Demolition Man. Demolition Man had Bullock (and a Schwarzenegger Presidential Library) and Judge Dredd had Rob Schneider. Wow. My senility knows no limits. If it’s any consolation, until you mentioned Bullock, I would have sworn the first movie I saw her was Speed.